Affectionately known as "Tutt", a native of Cuba, Alabama and a resident of Detriot, Michigan. Faithful member of Zion Hill Missionary Baptist Church Cuba, Alabama until moving to Detroit. 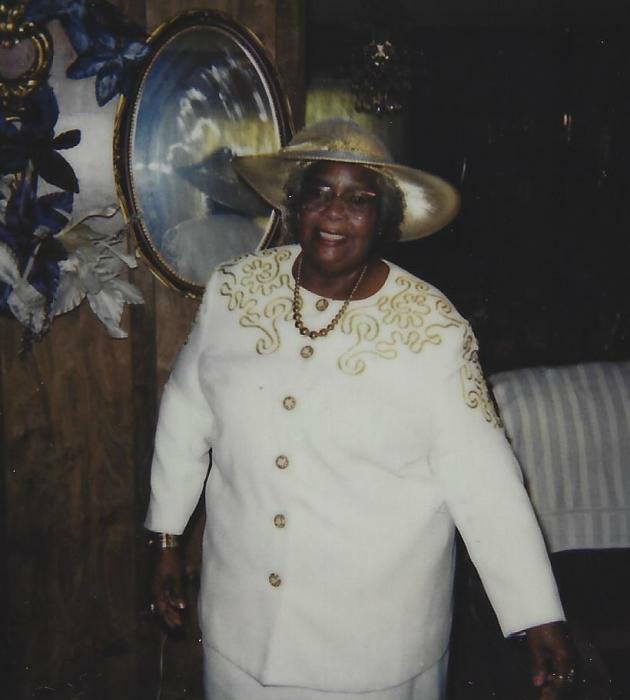 Service of memory will be Saturday, April 21, 2018 at 12 noon at Zion Hill Baptist Church (5051 Kinterbish Road #10, Cuba, Alabama 36907) with burial to follow in Cagus Cemetery with Westside Funeral Home Fairfield Directing. Visitation will be Friday, April 20, from 3:00 to 7:00 pm at Weatherly Funeral Home, York, Alabama, where the family will receive friends from 6:00 until 7:00 PM. Mrs. Johnson's memory will be cherished by her two sons: Roger (Pamela) Johnson and Ralph (Cynthia) Johnson; two daughters: Erma Jean Bollar and Emma Lee (Jimmy) Lindsey; 24 grandchildren, great grandchildren and great great grandchildren; two sisters: Jeanette and Berniece Hearn and many other relatives and friends.